Pre-sale tickets are available from 22 March until 12 April via Oeticket and at Village Cinema Wien Mitte, regular tickets during 13 until 22 April via Oeticket and at all box offices at the festival cinemas. *) Reduced tickets are available for students and pupils, trainees, seniors and holders of following cards: Cineplexx Bonus Card, EYCA, oetCard, ÖAMTC, Wien Energie Fernwärme Servicecard. **) VR Cinema at 4GAMECHANGERS Festival is freely accessible for visitors of the 4GAMECHANGERS Festival. ***) Many film screenings are followed by Q&A sessions where filmmakers will present their respective work and answer questions by the audience. These talks can be visited free of charge, but only after the end of the screening and depending on availability of seats. A regularly updated overview of all film talks and starting times can be found on www.letsceefilmfestival.com. 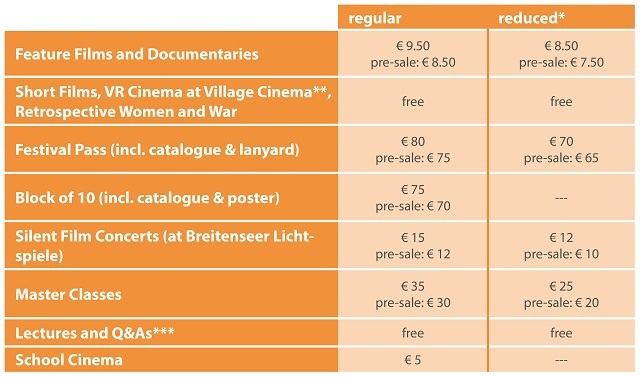 Tickets for all films and events of the supporting programme are available as of now on www.letsceefilmfestival.com and oeticket.com, at all Oeticket sales points in Austria, overseas via Eventim and at Village Cinema Wien Mitte. During the festival, tickets can additionally be bought at the box offices in Actor’s Studio, Artis International, Urania Kino and Breitenseer Lichtspiele. Reservations are not possible. For info about School Cinema contact education@letsceefilmfestival.com, about Master Classes contact education1@letsceefilmfestival.com. Tickets for screenings outside of Vienna can only be purchased directly at the local box office. For all feature films and documentaries: à la carte and at a special rate! With a Block of 10, you can secure ten tickets of your own choosing for all screenings in Vienna at a reduced price in advance and not only at the box office (but it’s of course possible there as well). Whether you want to attend a screening by yourself or with nine friends, the price of € 7.50 per ticket (pre-sale: € 7) is and will remain unbeatably low. For each Block of 10 you will receive a free festival catalogue (€ 5) and a free poster. Unlike the Festival Pass, the Block of 10 is transferable, but cannot be combined with other discounts. It’s quite easy: After buying a Block of 10 online, you will receive a confirmation of payment. As of now this is possible on www.letsceefilmfestival or on oeticket.com, at all Oeticket sales points in Austria and overseas with Eventim. Using this confirmation, you can pick up your Block of 10 at Village Cinema Wien Mitte, and from 13 April at Actor’s Studio, Artis International, Urania Kino and Breitenseer Lichtspiele. You can either exchange your voucher for ten tickets of your choice immediately, or get your tickets right before every screening during the festival week in each of the above-named cinemas. With the LET’S CEE Festival Pass you can, if you’re lucky, watch every film publically screened during the festival in Vienna. Thus, movie lovers and cineastes will certainly get their money’s worth for a favourable price. Vouchers (in the form of a payment confirmation) can be purchased for only € 75 (reduced pre-sale: € 65) on www.letsceefilmfestival.com and oeticket.com, at Village Cinema Wien Mite, at all Oeticket sales points in Austria and overseas with Eventim. That is how it works: After your purchase, you will receive a voucher as payment confirmation that you can exchange for a personal Festival Pass starting from 12 April at Urania Kino. Together with a valid ID, the holder of a Festival Pass is entitled to watch all films that are not sold out an hour before the screening. Just register in time at the box office and enjoy the show. The Festival Pass is nontransferable and valid for the film programme only, and not fort he supporting programme.